The Thanksgiving table is often full of items requested by just one or two of the guests. In the end, I always find it a less-than-satisfying experience. I’m not much of a holiday guy. I find Thanksgiving and Christmas stressful. There are aspects of it I like, such as photographing lights, seeing family, and having some time off. 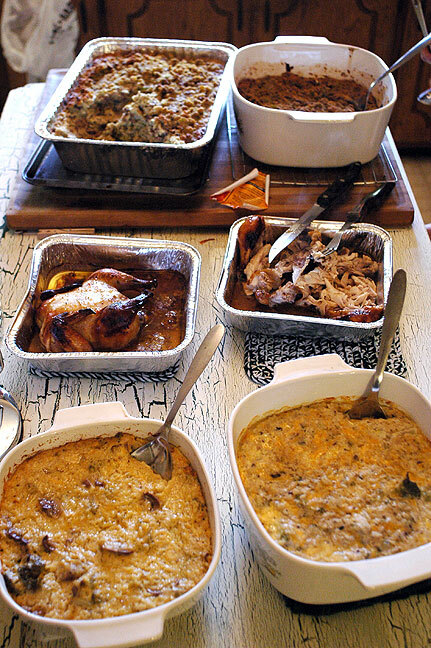 Traditionally, Thanksgiving is a feast holiday, featuring the traditional Thanksgiving dinner. I have no problem with a nice meal, but it seldom works out that way. It tends shake out to be four hours of cooking, 15 minutes of eating, then four hours of cleaning up. Also, because there are so many different foods, you really only get a small bite of each one. The reason there are so many foods is that despite efforts year after year to “keep it simple,” everyone has one or two items they want to have with dinner, “or it’s not Thanksgiving.” Someone has to have asparagus, someone has to have broccoli casserole, someone has to have jelly cranberries, someone has to have fresh cranberries, someone has to have walnut salad, someone has to have turkey breast, someone has to have sweet potatoes, someone has to have pecan pie, someone has to have potato salad… you get the idea. It’s “just not Thanksgiving” unless you repeat some memory from 40 years ago. The result is 20 items on the bar served buffet style, which you can’t really prepare and serve all at once, so most of them are cold by eating time. I’ve said it before and I’ll say it again, if it were up to me, Thanksgiving would be a day of fasting and meditation. Another really nice way to celebrate is to offer thanks. My personal tradition is to hang awesome quotes of thanks, some from the famous, some from those famous to me. Your friendship is a pillar in my pier, thank you Richard. We have a private thanksgiving on Thursday, friends on Friday, Saturday and our usual Sunday meal. We feast in moderation. We sit around and watch movies and sports. In between, we take walks and go shopping. The only stress is not burning food. And not getting so thankful that we can’t return to work on Monday. I heart* your third paragraph. Fortunately, I’ve almost never been a part of the preparation, but I’m almost always a part of the cleanup. My favorite parts were always: getting out of school, watching football on TV, and being reminded that Christmas was fast approaching. Here’s the thing though: I love to cook. I love the science of it. And this year our garden is full of fresh herbs like parsley, sage, rosemary, thyme, basil, mint, lavender, and oregano. There’s even stevia to put in our tea! Salad greens will be picked fresh that morning and dotted with our cilantro. And I love using all our prettiest China and wedding gift serving pieces. I’m not much of a holiday gal, but I’m glad my son is a holiday guy because he’s flying me to DC for Christmas. Though I was stressed, making the Thanksgiving meal is something I treasure. In recreating items my mother, grandmother, stepfather made or loved I feel connected to them. I can’t see a tofurkey without thinking of you, Richard. When I bring Mom’s pumpkin trifle to the holiday potluck, I feel connected to her. It is also bittersweet, because not everyone I have cooked with is still around. So it’s not the food, but the ritual that makes it Thanksgiving. I will give a shout out to my in-laws ritual. The women gather (no men or kids allowed) to prep the night before, drink wine, and watch movies. We all sleep over, have breakfast together, and then cook. It’s less of a marathon and more of a relay. I’m sad that you see Thanksgiving that way. My strong opinion is that everyone should tailor holidays to suit their needs and preferences. We do some cooking ahead, intentionally planning for not too much cooking or cleanup on the day. We spend time together as a family, enjoy the treat of nice dishes and table linens. We talk about what we’re thankful for. We’re aware of how fortunate we are to live where, when and how we do, and this is a chance to remember that. When the kids were smaller, we made a Thanksgiving tree by writing something we’re thankful for on a paper leaf and taping it to a paper trunk on the wall. I often left it up till the new year as a reminder that we have so much to help reduce the focus on presents for Christmas.